Now, this is more like it, NetEnt. The slots developer, who've been hit and miss over the years with some of their offerings, hit it big with their big-money collaboration with Universal, bringing a legendary film icon to a reel near you. 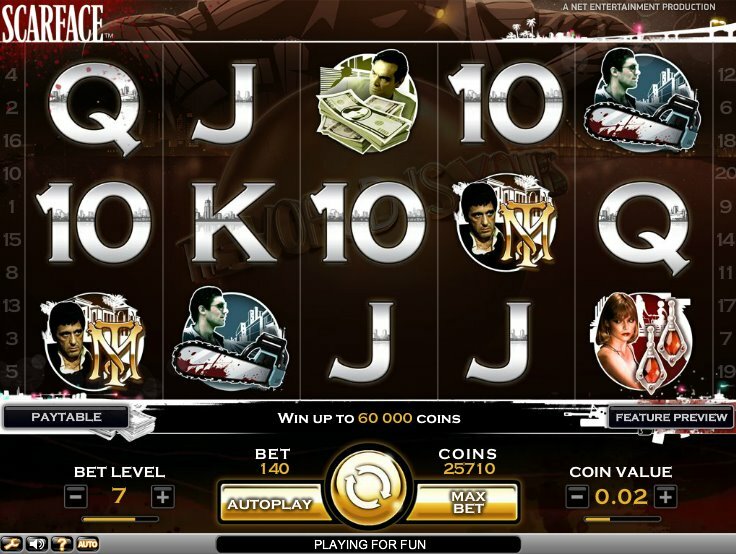 Scarface, a 5-reel, 20-payline online video slot, is based on the classic 1983 gangster flick that starred Al Pacino as a Cuban refugee in Miami building up a drugs empire. But don't expect naff cartoony graphics and comic-book blood - this video slot has tonnes of real photos and soundbites from the film itself. If you're new to the film, Scarface tells the story of a lowly Cuban refugee who escapes to Miami and swiftly rises up the ranks to become one of the country's richest and most powerful druglords. Along the way we get plenty of violence, natty suits and Michelle Pfeiffer looking great. NetEnt have maintained the suits and Pfeiffer here, wisely dispensing with the blood and drugs. Everything else is what you'd expect from a game based on the film: plenty of photo-realistic shots and stills from the movie are here, plus the generic 9-through-Ace card symbols. These feature Tony himself, the shimmying Elvira, played by Michelle Pfeiffer in the film, Manny, Chi Chi and other gangster icons from the film like a chainsaw, guns and cash. The 'Scarface Wild' acts as the Wild in the game. Wilds are stacked and can appear on the second, third or fourth reel. If an entire reel is filled with Wilds it will trigger a host of great features: Nudge Spins, a Free Spins Bonus game and the 'Say Hello to my Little Friend' Bonus round. If Reel 2 is filled with Wilds you'll be rewarded with a series of nudge re-spins. Once the Wilds disappear the round ends. This is a great cutaway scene showing the classic moment from the film. Simply pick bad guys for Tony to shoot and you'll win cash prizes depending on who he hits. 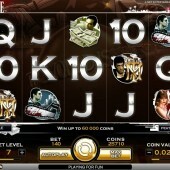 Finally, Wilds filling Reel 4 will earn you 15 free spins. Every win in this round is tripled and the spins can be re-triggered. I'm a big fan of Al Pacino so this was right up my street. I'm also a fan of nudges as it brings back memories of playing old-school fruit machines in the arcade. With its big-name tie-in with Universal, developer NetEnt have gone where online slot developer Playtech went with their Marvel slots. Be sure to check out that developer's comic-book themed slots X-Men or Fantastic Four for more quality film tie-ins.